We’ve reached the final episode of Series Six – at which point the series was to enter a four-year hiatus before it was brought back by popular (and largely American) demand. This episode was based on the novel Dumb Witness, first published in 1937. It was adapted for television by Clive Exton and directed by Edward Bennett. Exton remains largely faithful to Christie’s original story, with some notable exceptions. First, the setting is moved from the fictional village of Market Basing (and London) to the picturesque area of Windermere and the Lake District (also featured briefly in ‘The Adventure of the Clapham Cook’, and more extensively in ‘Double Sin’). Second, Poirot and Hastings are present much earlier than in the novel (as would eventually become the norm in later episodes – Poirot would be introduced to the proceedings as early as possible). This Exton explains by making Charles Arundell a friend of Hastings’s (again, a possible mate from his army days? – he has the most hilarious nickname for him at least – “Battler” Hastings); they attend an attempt at a boat racing world record on Lake Windermere. This little change enables Poirot and Hastings to be present at the séance referred to in the novel, as well as witnessing several of the events preceding the murder. Third, by making Poirot and Hastings ‘friends of the family’, Poirot recommends Emily to write a second will (and he later blames himself for her death). Fourth, the presence of Bob is significantly expanded – to great success. Here, he becomes a sort of assistant to Poirot, pointing out the impossibility of Emily’s accident and the trick with the mirror. I find that fact particularly funny, because Japp and others often refer to Hastings in the books as Poirot’s dog, obediently following his master! Speaking of Japp, I’m quite impressed that they didn’t fall for the temptation of adding him to the proceedings, not to speak of Miss Lemon (who would undoubtedly fit right in with the séance). That just goes to show that all in all they treat Christie with respect. Fifth, Dr. Donaldson, Theresa Arundell’s lover, is deleted, and Dr. Grainger’s presence is significantly expanded in his place. In fact, he becomes Miss Lawson’s lover and is even killed off in the end! Sixth, Jacob Tanios is portrayed as much more ‘villainous’ than in the novel, with a particular mention of him possibly beating his children (of course, Poirot reveals him to be innocent later on). Seventh, the above mentioned spiritualism is also significantly expanded, and it actually works quite well. Eighth, several of the London scenes are entirely or partially removed (and of course the setting is changed to the Lake District), but some of the money scheming is kept intact in a scene in which Theresa and Charles suggest a criminal act to Bella and Jacob. Ninth, a rather ridiculous attempted burglary at Littlegreen House with two masked intruders (Theresa and Charles) is added to the plot. Similarly, the boat they escape in is pictured at the Trippses’ house (a suggestion that they might be involved). All in all, the changes are done for two main purposes; one, to shorten down the plot (due to the time constraints) and two, to widen the net of potential suspects. They largely make sense and they generally keep more or less faithful to the novel. Two final changes are worth noticing. One is the explanation why Bob isn’t the murderer (or, reason for the accident). 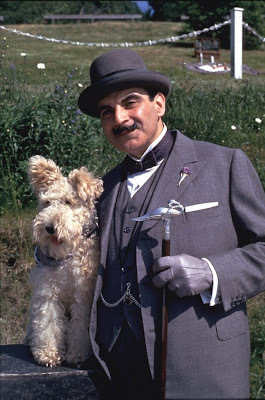 In the novel, he has simply been out all night, while in the adaptation he shows Poirot that he always lets the ball fall down the stairs and then leaves it in his basket, so there would be no reason why it should be found at the top of the stairs. A rather clever explanation, I would say. Also, there’s the added hint about the liver capsules. Poirot notices a waiter refilling the salts at the tables of the hotel, which leads him to realize that the murderer simply waited for Miss Emily to take the right capsule. Again, a clever change that doesn’t stray too much from its source material. Bennett’s directing is particularly well done in this episode, with absolutely wonderful scenic shots of the Lake District (which look particularly stunning in the remastered Blu-ray editions). He emphasises the red nighttime sky particularly, and he seems to have a lot of fun with highlighting the dog angle of the story, with several shots seen from Bob’s perspective (see, for instance, the interview with Miss Lawson after Emily’s fall – just before Bob shows Poirot his trick). The production design is fabulous, as always. It never ceases to amaze me how they manage to track down all these 1930s props in pristine condition (like the race boat and the peculiar-looking bus). Locations used include Langdale Chase boathouse (used as the boathouse, obviously), Broad Leys boat club (used as the hotel – both interior and exterior), several houses in Keswick, Cumbria, Lake Windermere station, the old police station in Hawkshead and Lake Windermere itself. Gunning’s soundtrack is good and rather memorable, particularly the theme he gives to Bob. It has not been released. Suchet gets lots to play with here. We have, for instance, a brief reappearance of Poirot’s suitcases on Lake Windermere station (last seen in Death in the Clouds, I think), his lamentation on the loss of a client (‘Could I have saved her?’). Also, there’s his peculiar little picnic chair (last seen in ‘The Mystery of Hunter’s Lodge’), which he brings with him when walking the dog. (His “conversation” with Bob in that scene – in which he provides an explanation of the adaptation title, is absolutely delightful). Of the guest actors, there are several memorable performances, but perhaps Ann Morish (Emily Arundell), Pauline Jameson and Muriel Pavlow (the Tripps) stand out. How many times can they put Poirot on the scene, socializing with the family way ahead of the crime, and have the crime still happen anyway, before Poirot begins to look...not so great as a detective? But by the same token, shouldn't the murderer-in-the-making realize they're going to be caught after the fact by Poirot? I thought some of the plotting of the clues here was almost BETTER than in the book. I like to think Albert WOULD want his people to take Bob in...he wouldn't want them to be dogless and he wouldn't want his fellow canine to be homeless...or in danger of being "executed", as Bob really was. Did anyone think Theresa and Bella looked too much alike? A huge difference from the book where the former's liveliness and the latter's dowdiness are emphasized. Here we could barely tell them apart. Kevin Elyot talks about Poirot always being an outsider...I think sometimes that works to his advantage, as it did here: he didn't share the prejudice that the English characters felt about Jacob. I don't know why they had to kill off Grainger...he and Minnie were the only ones who deserved a happy ending! Especially since here they cut out Minnie's one devious act from the book. "What make of dog is this?" "A fox terror perhaps?" This vastly improves on the book, which I found to be a dull series of repetitive interviews and silly pretences on Poirot's part. This turns the same premise and characters into a proper story, and it's damned funny too. It also gives a better reason for the title and makes it more central. The Tripps are wonderfully weird. Which story has someone who tried to murder being forgiven and a girl eventually marrying him, never bringing him to justice in the series? Taken at the Flood for one. But I've a feeling there are others I can't think of off the top of my head. In addition to Taken at the Flood, you might be thinking of the adaptation of Mrs McGinty's dead? The man wasn't guilty, but the girl succeeded in clearing his name. Physically, they looked similar. Emotionally, they are as different as they are described in the novel. I wonder . . . did Hastings and the other English characters simply tolerated Poirot because he is a celebrity? Or did they tolerated him, because he came from the "right side" of Continental Europe, unlike Jacob Tanios, who came from Greece? I alway love when animals or children are included in these stories. Did they goof up With the Liver Capsules? At Jacob Tanois' first appearance at the motorboat club, he complains that John gave Emily useless liver capsules. Later, at the time of reading the will, John Grainger complains that the liver capsules are useless. I rewatched the specific parts, and I realize that Jacob didn't specifically say that the liver pills came from John. So I conclude that someone else had given them to her, and that both John and Jacob thought they were useless.